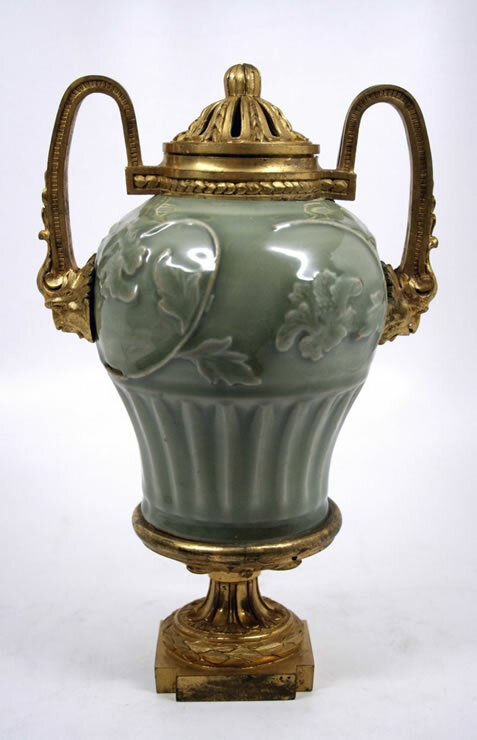 Rare Yuan celadon pot-pourri vase mounted in early Louis XVI ormoulu mounts. The vase is glazed with an unctuous celadon glaze and is decorated with scrolling branches and peonies in relief. The vase rests on an incurvated ormoulu plinth on a square base with re-entrant corners and has two ormoulu handles at the neck terminating in mascarons. The domed top is reticulated. It is very rare to find early Chinese porcelain with French eighteenth century mounts. The porcelain, called a “yen-yen” vase, originally had a tall neck.